Posted On February 12, 2015 by Team iCynosure. Face Washing and grooming is one of the oldest beauty rituals that goes back to the Greek and Roman times. Cleansing and scrubbing were considered so essential that people created special places all over the place in way of public baths, bathhouses and private suites. Over the years, face washing has evolved from a public activity using herbs and miraculous water to a more private ritual with amazing face wash products that help prevent bacteria, reduce harmful buildup and directly affect the health of your skin. Numerous national and international brands have a range of grooming products and all of them cater to the need of a special product just for the face. And when a brand synonym with India, Godrej launches another product in the face wash category, it definitely needs to be tried. 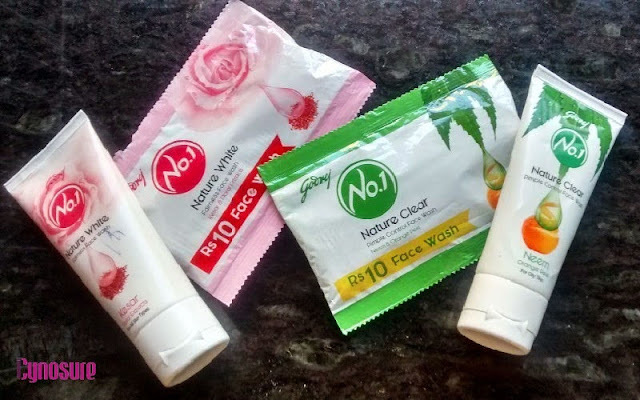 What are Godrej No.1 Nature White and Nature Clear all about? Godrej No. 1’s Natural White states that it brightens the skin through a natural ingredient; Kashmiri Kesar. It is known for its complexion enhancing properties. Godrej No. 1’s Natural Clear states that it can help in controlling pimples through double purification via Neem and Orange peel extracts, which also reduces oiliness in the skin. What does the ingredients list of Godrej No.1 Nature White and Nature Clear look like? Godrej No.1 Nature White contains Water, Sodium Laureth Sulfate, Acrylates Copolymer,Cocamide MEA, CocamidopropylBetaine, Glycerine, Fragrance, Niacinamide, Titanium Dioxide, PEG-150, PenataerythritylTetrastearate and PPG-2 HydroxyethylCocamide, DMDM Hydantoin, Sodium Hydroxide, Disodium EDTA, GelidiumAmansii, Cl:73360, Crocus Sativus Flower Extract and Rosa Canina Seed Extract. Godrej No.1 Nature Clear contains Water, Sodium Laureth Sulfate, Acrylates Copolymer,Cocamide MEA, CocamidopropylBetaine,DecylGlucoside,Glycerine, Fragrance, Sodium Hydroxide, Disodium EDTA, DMDM Hydantoin, PEG-150, PenataerythritylTetrastearate and PPG-2 HydroxyethylCocamide, Cl: 42090: Cl:19140, Cl:11680, Cl:73360, GelidiumAmansii, Triclosan, AzadirachtaIndica Leaf Extract, Citrus Sinensis Peel Extract. 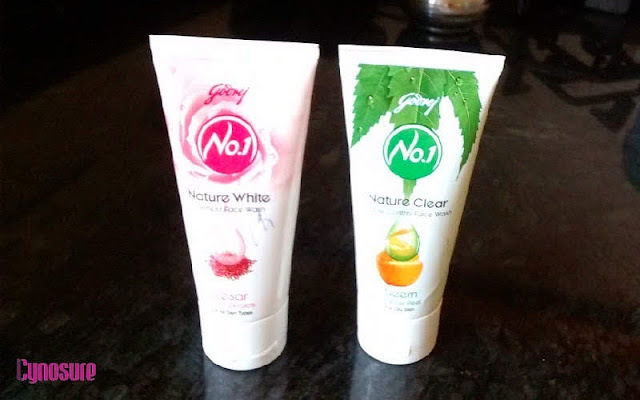 How are Godrej No.1 Nature White and Nature Clear packaged and priced? The Face Washes are packed in a soft squeeze tubes with a flip cap. With soft colors, the product looks soothing and refreshing. Priced at INR 35 for 50g, and a shelf-life of 24 months; the product is surely worth a try. I’ve used both the variants over a period of a fortnight and I must say the products are good. The Natural White face wash is truly a gem with extracts of saffron. It does not really give you an instant glow from day one, but over a period of a few days, you will feel a visible difference. The saffron pieces in the face wash work as a great exfoliato and thus the product does not lighten or whiten the skin. It actually removes or reduces the tan and neutralises the overall skin tone. However, sometimes it does make the skin a bit dry. So moisturizing the face immediately after its use is a must. Additionally, it is affordable and convenient to carry around. 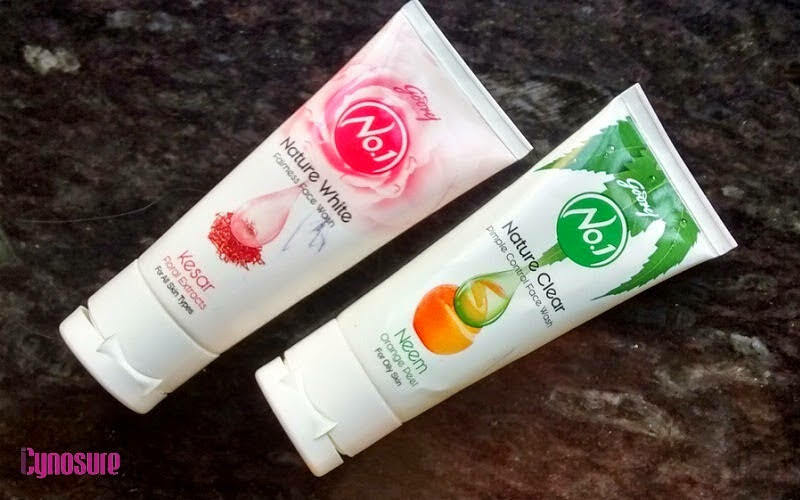 The Natural Clear feels more gel based as compared to Natural White, which contains neem and orange extracts. A sure shot for those who suffer from acne and pimples, the products work wonders on combination skin type; reducing irritation and oiliness. Surprisingly, a little quantity lathers enough to clean the face thoroughly and the product does not leave the skin dry or stretchy. It does hydrate the skin simultaneously while cleansing it. Again with the price and convenience, the product is a winner. Will I recommend the product to friends/family? Sure, Yes! Will I purchase the product again for personal use? Definitely! To know more about Godrej No.1 Nature White and Nature Clear Face Washes click here. Have your tried any Godrej product? Share your experiences in the comments below. Great review - what are the differences between the red and green? Different scents?